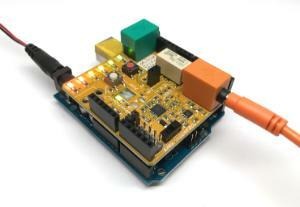 Control machines with your brain using the Muscle SpikerShield. As part of their effort to inspire a new generation of homegrown neuroscientists, Backyard Brains created the Muscle SpikerShield Bundle to empower students to perform simple and complex experiments in the fields of neuroscience, electrophysiology, robotics, and computer programming. 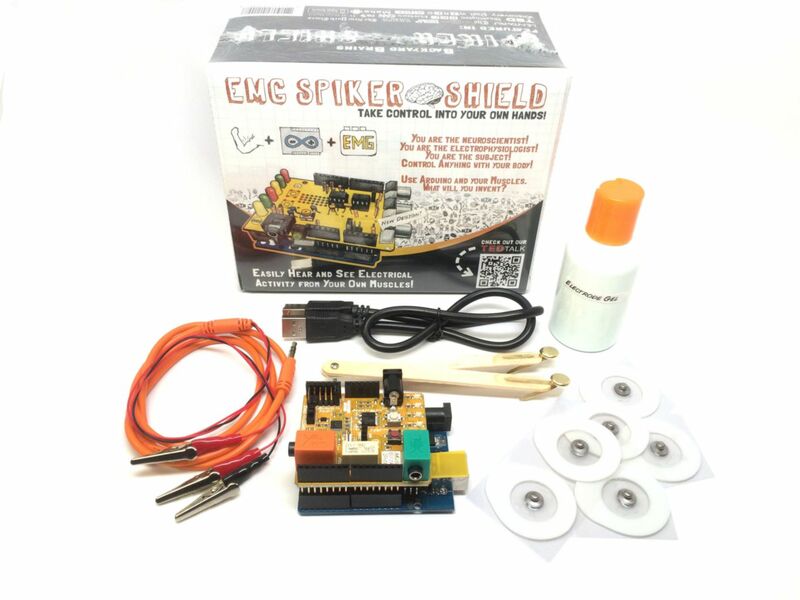 Establish a connection to your Muscle Spiker shield with non-invasive skin-surface electrodes (sticker patches for large muscles such as your arms and legs and brass popsicle sticks for eyeblinks and fingers). The sensitive Muscle SpikerShield can detect a wide range of signals from your body, allowing it to differentiate between different muscles. 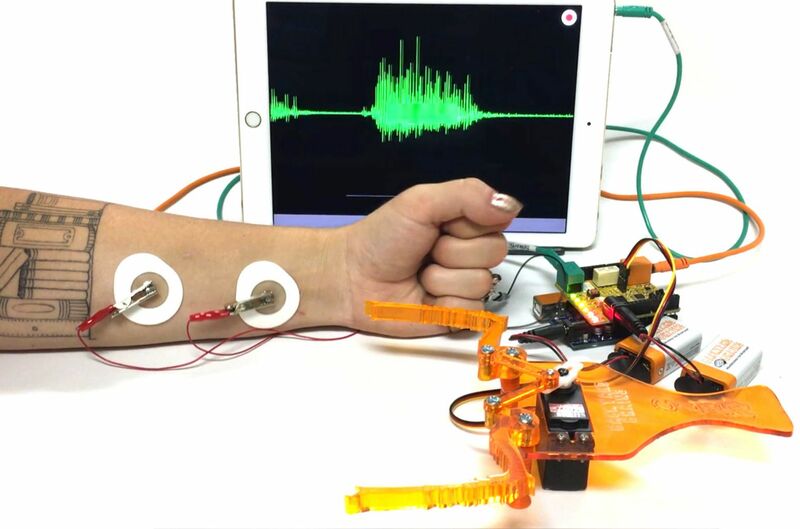 Watch as your invention, powered by the electrical activity of your muscles, comes to life. 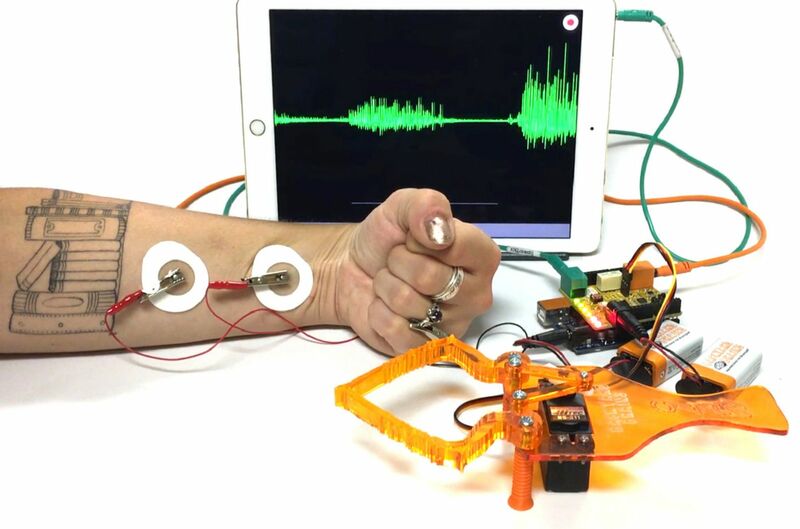 The Muscle SpikerShield allows you to control lights, videogames, neuro-prosthetic arms, and more. Imagine creating an Etch-A-Sketch you can control with your brain or a costume that changes colors when you flex. Artists, designers, cosplayers, and hobbyists can create their own interface or follow from a robust collection of experiments with this pocket-sized package of circuitry, microcontrollers, connectors, and lights. Ordering information: The Muscle SpikerShield contains:1 preassembled Muscle Spiker shield, 1 orange recording electrode cables with alligator clips (red, red, black), 1 Arduino microcontroller with a preloaded code, 1 USB cable for powering your Arduino, 6 EMG sticker-patch electrodes for large muscles, 1 adjustable wooden electrode holder for small muscles, and 1 small bottle of electrode gel for use with the small muscle electrode.